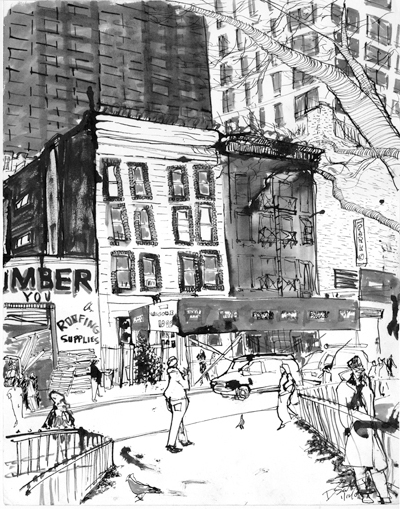 Just off 2nd Avenue, sitting beside the western end of Century Lumber on the south side of 97th Street on Manhattans’ Upper East Sideâ€”not quite Carnegie Hill, not quite Spanish Harlemâ€”are two 100 plus year old apartment buildings. They are the only such structures on the street. Ten years ago they were the only residential spaces our side of the block. For nearly a decade this was where I called home. With a bit of remorse but full of new direction (and much more space), I now live a bit farther off Second Avenue in a quaint little town called Beacon (and that, for those of you who thought 97th Street was upstate, is upstate, though still only a very southern part of it). Living on 97th was the reason I, unlike so many other New Yorkers, actually knew that the Second Avenue line really was underway. Regardless of a New York magazine cover story in March 2004, or reading through any one of the New York Times articles as if they were already history long past, most of my fellow New Yorkers replied, “Really, they started that?” when I made mention of it. Not unlike many of my friends and co-workers at the time, I had never gotten off the Lexington Avenue line above 86th Street, at least not between 86th and Gun Hill Road in the Bronx. This was the first time I took it north of 86th street in Manhattan. Well, maybe the second. I don’t quite remember if I took a bus from the west side or the 6 train to 116th, but there was an un-dumpy apartment that she took me to between 115-116, all the way east. It was actually beautiful, cheap and I think the last place we looked at a few weeks prior. It was just not in the easiest to get to location and since my hours were horrible, I couldn’t feel safe having my wife come and go without me. So with the bar raised we were now walking to what I assumed would be the first of a new round of true winners. The upper east side was fresh turf in our search for bad apartments. At that time the block was half as full with buildings as it is now, with a tiny fraction of the people. On the Third Avenue end stood a beautifully built square mosque rotated at a 45 degree angle to the street, with a tall tree lined fence around the grassy perimeter. Behind it, in perfect New York contrast, was a cinder block shell of a two story building, spanning from the north to the south end of the block. I would come to find out that the unfinished building was intended to be the Islamic Learning Center for the mosque. Situated right in the middle of the entire block, stretching between 97th and 96th streets, bordered on the west by the Learning center to be and on the east by two sets of brownstones was a rather large outdoor parking lot. Well lit and open 24 hoursâ€”in hindsight this was a decent security extra in our location. So upstairs I go in this modest building that reeked of my grandmothers Bronx five floor walk up. The signs were feeling good as cautious as I may have been of what the childhood memories might be hiding. I entered the empty domain and saw the first apartment that fit our needs. I had never really considered a railroad, but we were two people who would hopefully share a bed most nights, so we would never really be lacking privacy, we were preparing not to have any. The broker showed us one on the third floor and a second choice on the fourth floor, both newly painted and with relatively recent renovations. My wife had reservations about being on the top floor, something about being so close to the roof accessâ€”I still don’t understand what she meant. I however liked the french doors on the third floor. So, with our pick of the crop, we signed the lease the next day. Fast forward seven years. Life was set, moving along rapidly, and rather than wait for our dream house we decided to add to our family. I had always thought about the age of our apartment, when it was built, and how many people more than likely lived in it. Maybe I have this over exaggerated idea of tenement housing but I figured 3 families (one for each room) lived in what was now occupied by two individuals. We really hadn’t worked out the details of space and were into our fifth month of expectation when the outside world started to catch up to us. Some noise downstairs one day and a notice on the door the following morningâ€””construction will begin in your apartment in two days, please be available to let the crew in or arrange it with the super.” Life started to spin a little too rapidly. Maybe I was wearing them too. A few years after we moved in our super brought an engineer around to survey the apartment building, looking for existing damage, cracks to walls and so on. Turns out, a developer bought the parking lot and the rights to the cinder block shell of a learning center in order to build a 41 story high rise, right next door. We had the buffer of the other brownstone on our western side, but that would prove to only cause us more harm than good. Construction took a while to get underway but when it did we rattled through months of pile driving, pounding, drilling and the like before any actual building took place. It was terrible. Once I swear I was shaken right out of bed. This lasted from spring until late fall. Fun to draw, not so much to live next to. Then one rainy late November Friday night, after the first thaw to an early winter, I hear a few expletives come from the bedroom as my wife is getting ready for bed. Having spent very little time at home that day we found out the wall was trying to run away from our building. It turns out that our neighbors next door who owned their apartments asked the construction crew to forego with pile driving of the supports as work got closer to our buildings (there was an accident months back on the other side of the block). So instead they drilled and removed, and drilled and removed, and drilled and removed dirt to place the supports in the ground. Unfortunately they drilled and removed until there was no dirt under the western side of our neighboring building. For lack of ground the building next door shifted close to ten inches towards the new construction, away from our building, pulling our wall with it. We now had a 6 inch gap around our wall, as if Andre the Giant pushed the wall to make a little more space. Great if it had a floor and adjoining walls attached to it, not so much if you thought you could have little furry guests stopping by at any moment. We were very fortunate in New York City terms, to this point having not seen a sign of a single rodent in our apartment. Two mice would make a try at squatting before we left. A friendly New York warning. There are many bureaucratic aspects of New York. There are 8 million reasons to live here, but just as many to take heed. If you choose to take residence you will not be disappointed, but learn the system and learn it well. There are no excuses for questions not asked. Ever. This is a prime example of the squeeky wheel getting the grease. Don’t just squeekâ€”squeek, squeel, howl, scream and holler. It aint worth the alternative. At the moment the walls began to fall I called 311. For those of you who don’t live in New York City, 311 is a non-emergency equivilant to 911. If you do not need police or medical help, you call 311. If your landlord isn’t doing what he or she is supposed to, call 311. Construction at 1 AM, call 311. I can’t say you will resolve your problem, but you will get it on recordâ€”the first step to any recourse. I did not take the first step properly. My fear of the moments to come were in regards to the construction plans for the next morning. I made friends with the guys at the site as I drew the construction over the months prior so I knew from my daily chats that the following morning was when the street was being closed and the crane erected for the construction. The entrance to the site was literally where they pulled too much earth from under our adjoining building. I figured the crane was being placed near this spot. So I called 311, complained, requested as high a power as I could get at 2 AM, informed them of the work the next morning that I feared could cause further damage and was told that since they had a permit to do the work there was little that could be done. Now, here is the warningâ€”THIS IS WHEN YOU SCREAM. If someone who answers calls on a Friday night at a call center tells you that there is not much you can do, demand everything, threaten to call the papers, go out and stand in front of the trucks, do whatever you have to do to get someone to get out there at that very moment. What I should have done that night is lie through my teeth. I should have told the inept woman who answered the phone that early morning that the sky was falling. I should have told her that the damage was still happening and I wanted someone to come out to inspect for my safety, now. You see, I learned this the day after the notice was put on the door three years later. Before I even woke the next morning the crane was installed at no extra pain to my building. The site supervisor came upstairs and inspected the damage and within the next two months sent guys to fix the walls. I called my management company, who I thought told my landlord. I did what I thought was adequate. Everyone seemed to think that the wall was secure, the building was safe and all should be fine. Three years later and five months into my wifes pregnancy we were told that our landlord was fixing the wall, at least that is what the notice alluded to. Yes, that is how we were informed, after years in the apartment, by a notice from the construction company. Not a call from our landlord or a letter from our management company. Immediately I went downstairs and talked to the contractors doing the work in the empty bottom apartment. Their explanation was not quite the same as the notice they placed on the door. A support wall would be built two feet from the damaged wall and a big hole would be knocked into the wall to inspect how to proceed. Final repairs would begin around 6 months from the time they completed this work. First I called the management company. They once again knew nothing. Next I called my landlord. He was not happy. A nice enough landlord, but he was a New York landlord. His concern was not for his tenants or his building, but his investment. He needed to do this work for a pending lawsuit, hence the urgency to fix our apartment three years later. No compensation mentioned for the removal of the space taken away from our apartment caused by the supports being built to brace the further damage they planned on doing to the walls. No concern for my pregnant wife or the baby that would arrive just about when the final repair was scheduled. Just words about me holding up the work. Yes, holding up the work that took three years to start. At that point I did not know about the lawsuit, I just knew I could not move and that is what I told him. I refused to let him in and I refused to let the work be done unless I was given word in writing as to what was happening and how long it would take. Experiecnce makes you wiser and even though I had no idea where I was getting off this ride, I jumped right on and demanded everything, knowing nothing of my rights. It was a good stall. Here is the second bit of advice. When you know nothing, call everyone who may. This is where not asking the questions can bite you in the arse. I had been bitten once three years prior, it wasn’t happening again. In the next four hours I was on the phone with my business lawyer, four government departments (turns out there was no record of my 2 AM call three years earlier because I didn’t demand assistance), two NYC tenant lawyers, and a few friends just for peace of mind. Conclusion, don’t move. Well, eventually my landlord could force us out, or rather force himself in for the repair work, so with fours months left until our child was born, I didn’t want that time spent fighting a losing battle. Nor did I want my wife or a baby in any construction zone. We all needed to come to a compromise quickly. He offered up two options, move us to the other side of town in another building he owned or upstairs to an empty apartment on the opposite side of he building out of the construction zone. Honestly, I wanted to just lay down and wait for the wrecking ball. But I had some things to do and as you can tell by the drawing the building still stands. We chose option 2. Much easier to move up a flight than to the west side. Plus, I knew nothing of the west side. Where would I get my cranberry scone in the morning? No point in making this a short story now. The next day proved to be the revealing moments of my landlords position. Like I said, nice enough guy, but not worried about anyone but himself in this situation. He didn’t check his hand going into this game and he didn’t know his opponent. Not that I am a hustler of any kind, but I at least know the basics of the game and I had full knowledge of my hand within hours of our first talks. I could stall this out for months before he got into our apartment. With a pregnant wife and eventually a child in the apartment, I could stall it out for years. I never had to use that card, but he could hear it in my voice. He once again worried about the money he was losing each day I stopped construction. Not my concern, he bought the building and collected good rent from each of us. That’s his product and he can’t sell a faulty product without recourse. So with the better hand I made my demands, to which he listened to about one of them, and said fine, “I will do it, can you be out tomorrow.” “No,” I replied, letting him know it would be at least a week. I felt the flames from the other end of the phone. I also told him I needed it in writing, which he should do. His lawyer wasn’t “available,” or as I came to understand, worth the price of calling for something like this. Point two where he didn’t know his opponent. I may not be a lawyer but I have written many contracts in my freelance career, enough to know how to keep it simple and to the point. I told him he would have it in two hours. Let’s just say when he called back he was not any happier. When you are down, try to drag down your opponent. “What did you do, call a friend who thinks they are a lawyer?” Pending fatherhood makes you a bit resilient to this. I pissed him off by keeping a calm tone, telling him that no, I actually did talk to a lawyer, three in fact. They all told me not to move at all. He hated lawyers. The man who was relying on a team of lawyers to recoop money he had yet to spend on repairing his building. I know it is the naive corner of my brain that finds it funny, but how is it that the people who cause the reason for needing lawyers are the ones who typically hate lawyers. Ok, back to my own reality. So with my demands written, which was how I knew he wasn’t listening when he said fine to them a few hours earlier on the phone, he started to go off. When I checked the other apartment there was no lock on the door or in the hole that the deadbolt once occupied. The last tenant must have painted around furniture, because there were dresser sized frames of oddly colored paint all over two of the rooms. And, there were no bars on the windows, something we dealt with when we moved in, another point at which he didn’t know his hand when we signed the lease. I wanted all of these issues resolved, I wanted a week to pack and I wanted him to pay for the move (that was actually his idea and the one thing he never did do). He said as a landlord he was not responsible for any of that (actually he was responsible for the gates) so he wasn’t paying for it. I told him that as a tenant I already had all of those things in my current apartment and was quite happy to stay where I was. If he wanted me to move, he would have to at least get the apartment up to the condition to what we currently had. I started packing the next day when he faxed back my signed contract. Irony is a funny thing. So by the following weekend my best friend who spent many nights on our couch, his wife, my parents and my sister all helped us move the bulk of our existence up a flight. Two days later my good friend Eddie, yes, this Eddie, helped me move the bulk of what would hold the bulk of our existence. Minor advice, but advice none the less. When you move anywhere, check all the doors before you sign a contract. It’s of no use to live in a railroad apartment and have the lock on the secondary door be nearly welded shut. It’s also not so cool when you planned on using that passage to move in furniture. By the time my wife returned from work and walked the extra flight, our apartment was nearly complete in it’s mirror image of our last. For those paying attention, yes, we just moved to the apartment that we turned down 8 years earlier, the one with the so called roof access problem. After cleaning it over the previous week, slowly watching it get painted, and moving our life into it as if it never existed on the third floor, we asked why we didn’t choose this one the first time. I told her it was the french doors, they were fancier. The real loss. We moved upstairs vs across town because we knew that our days were numbered in Manhattan. We didn’t want to upend our life that we had rooted in this 100 year old building that we called home. Like I said, when we signed the lease we never intended to stay as long as we did, let alone forever. Not that we had some great plan at the time we moved upstairs, but we knew we would be looking for our next step over the coming year. And yes I heard several times “You don’t really want to buy a house,” as I turned down options and possibilities for our future. From the moment that wall started to fall to the day we moved out six months ago, we noticed all the little things that our rose colored glasses blinded us to for years. But it wasn’t the extra cracks that made us aware of it, it was that we started to realize that we had no control over the fate of the cracks. My landlord doesn’t know how many times I patched up his property because unlike him I cared more for his investment than he did for our life in it. At the moment I was forced to move upstairs I realized I would no longer have time to repair someone elses cracks. The next year and a half in our apartment would be our best time in the neighborhood, making it that much harder to leave. But part of what made it so was also what gave us reason to move. I knew the decision was right when our daughter turned the corner in our new home a few months ago and ran away from me screaming, just because she could. And though we seem to have great neighbors here in Beacon so far, I will most likely never again have a super to sit on the front stoop with, neighbors who run inside their apartment to avoid talking to anyone, a narrow passage of a living room that is blocked by a best friend staying for the night, or the friends to share the fate of the building that we all made a home in. I can send our friends daughter a birthday card or a her parents a little note now and then (next thing on my to do list), but we are no longer waiting to see what happens with our home, it is now just their home. We moved out as quickly as we seemed to move in, which I guess dulls the feelings of change in times like these. The difference is that when we moved in it was the start of something pretty wonderful and unknown, nothing was severed to make it happen. When we moved out it was a shift of our whole life together. Not just mine and my wife’s, but the five families who still lived in the building. We may be the last families to live in that 100 year old building as the subway construction will undoubtably shake our little building one crack too far. Like family, some of us talked more than others, and like family we shared a history with each other unlike that with any other person in our lives. I can tell the stories a hundred times, but it will never mean to my trapped audience what it means to my family on 97th Street, just off Second Avenue.